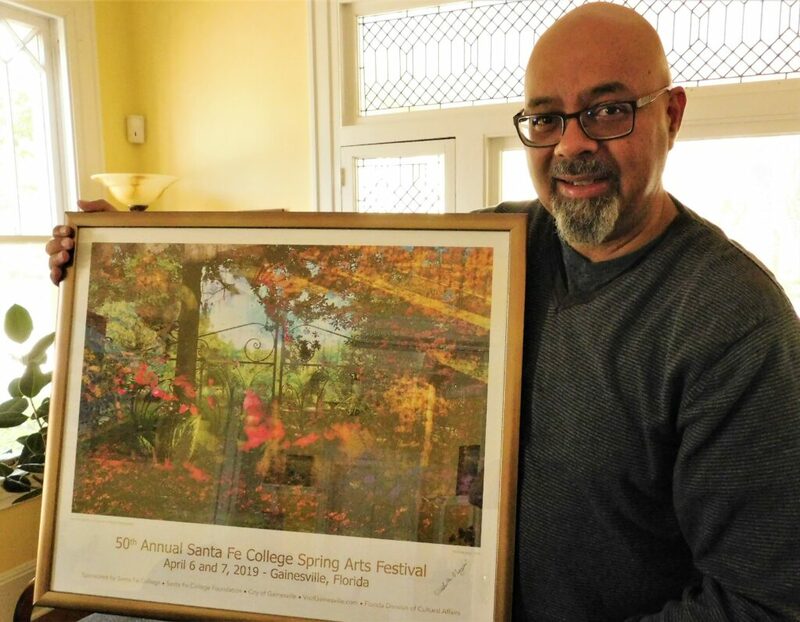 The Santa Fe College Spring Arts Festival celebrates its 50th year with a commemorative book featuring all the show’s posters from over the years. Fasten yourself into the time machine and get ready to flash back to [cue sound effects] … 1969. 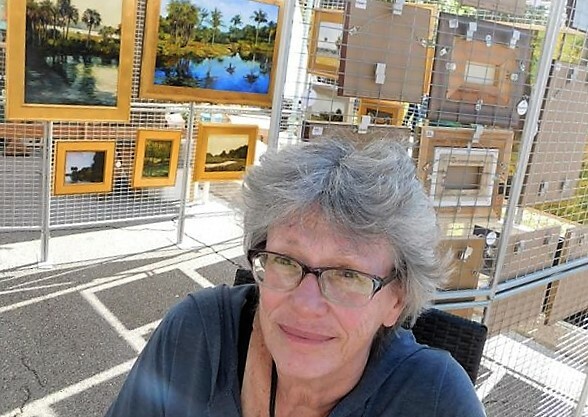 In the months before humankind first set foot on the moon, before Woodstock was etched into music history and before the “Miracle Mets” won a World Series, Barbara Kirkpatrick organized a small exhibition of artists on the grounds of the Historic Thomas Center in downtown Gainesville. Kirkpatrick taught English at what was then Santa Fe Junior College, which held classes in the Thomas Center back then. She convinced a small group of faculty and staff to support the art show as a way to engage the community and draw attention to the 3-year-old school. A dozen or so local artists participated that first year and a few hundred people attended the one-day event. Over the next decade or so, Kirkpatrick saw the art show she founded grow by leaps and bounds. She passed away in 1985, but her legacy was intact. When the 50th Santa Fe College Spring Arts Festival takes place this weekend along historic Northeast 1st Street, some 220 fine artists and craftspeople will display their work and — if the weather cooperates — upward of 100,000 art enthusiasts will attend the two-day event. 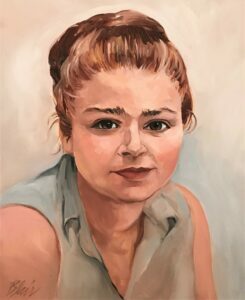 A portrait of Barbara Kirkpatrick, founder of the Santa Fe College Spring Arts Festival, painted by Eleanor Blair. In tribute to the festival’s founder, a portrait of Kirkpatrick adorns the fireplace mantel in the Santa Fe College Spring Arts House, 636 NE 1st St. The portrait was painted by longtime Gainesville artist Eleanor Blair and dedicated in Kirkpatrick’s memory in 2004. Blair has shown her work in the Santa Fe College Spring Arts Festival every year since 1972. No other artist has participated in the show longer. In fact, Blair lived in an apartment only two blocks from the Thomas Center in 1972 and was unaware an art show was about to take place. Blair rushed back to her apartment and grabbed an armload of paintings to sell at the show. She’s returned every year since then. In 1981, Blair suggested to festival coordinator Lona Stein that the show draw more attention to itself with an annual poster. Blair delivered the painting to Stein only to be informed that the festival had run out of money to print the poster. Blair then sold the painting to someone in Plant City only to be told later that Gainesville businessman John Storter was underwriting the cost of printing the poster. Blair borrowed the painting from its new owner so the poster could be printed. The deal with the festival was that she would get “paid” in posters. Not until Blair put a message on Facebook seeking that original festival poster did a dear friend named Clint present her with a framed version. Blair created the 1982 festival poster as well, and the same thing happened: It sold out after she had sold the original painting. Beginning in 1983, the festival’s poster artist was determined through a contest. For many years now, the festival coordinator has chosen the poster artist, including Michelle Nagri this year. 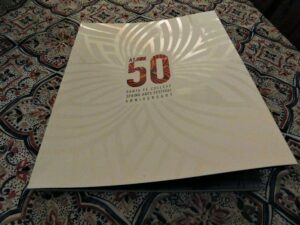 The “At 50” commemorative book looks back at 39 years of Spring Arts Festival posters. 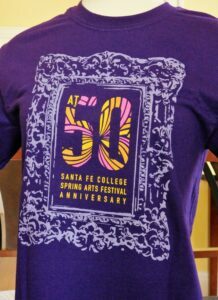 To honor its poster artists through the years, the Santa Fe College Spring Arts Festival committee has published a coffee-table book titled “At 50.” The 94-page commemorative book provides a history of the art show through its 39 posters and 34 different poster artists. SFC President Dr. Jackson N. Sasser, Villarreal and others contributed to the book. Only Blair, Lennie Kesl and Annie Pais have each created three posters for the festival. William Schaaf and Norman K. Jensen have both done two. Three posters received dual credit. 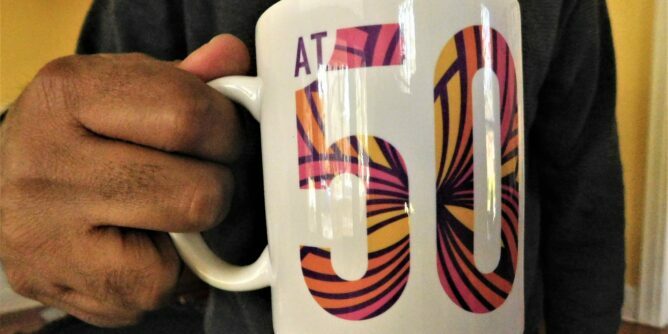 The “At 50” book will be available for $40 at the festival information booth along with commemorative totes ($20), coffee mugs ($10) and royal purple T-shirts ($15-$20). Also available are prints of Nagri’s festival poster, titled “Into the Garden of Dreamers” ($20). Nagri will be available to sign the posters while Hector Framing and Gallery will offer a discounted festival price to frame the poster. In addition to Blair, past poster artists Kana Handel, Allison LeBaron, John Moran and Mike Segal will be selling their work again this year. The Santa Fe College Spring Arts Festival will have some notable changes for its 50th year, including a new entertainment stage. The temporary stage adjacent to City Hall replaces Bo Diddley Plaza so that festival-goers no longer have to cross busy University Avenue. The area will also include a beer garden sponsored by First Magnitude Brewing Co. The Santa Fe Stage will host hourly entertainment throughout the festival. On Saturday at 6 p.m., after the artists’ booths close, there will be a concert featuring Elio Piedra along with Miami-based Renesito Avich, Yunior Arronte and Jorge Tamayo performing everything from Motown classics to Latin rhythms. For the second year in a row, there will also be ongoing festival entertainment on an indoor stage at Actors’ Warehouse, 619 NE 1st St. 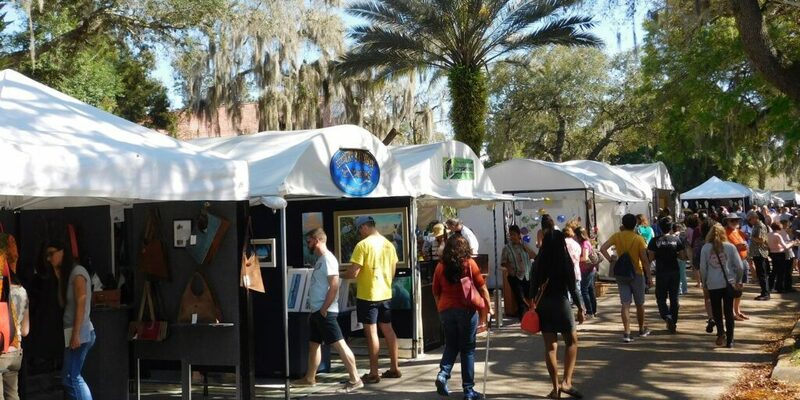 The festival will also feature the work of young artists and a children’s creative activity area adjacent to the community artists’ booths on the northern end of the Northeast 1st Street near 8th Avenue. Although there will be 17 food vendors and continuous entertainment, the primary focus will be on the artists displaying work in every medium and competing for awards in 2-dimensional and 3-dimensional categories. Festival hours are Saturday 9 a.m.-5:30 p.m. and Sunday noon-5 p.m. Admission is free. The Spring Arts Festival is organized and supported by Santa Fe College and the Santa Fe College Foundation. For further information, including a schedule of events, visit the Santa Fe College Spring Arts Festival website.